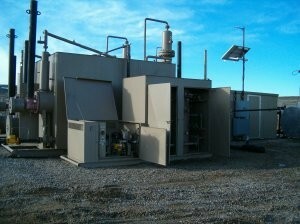 Engineered Concepts, LLC emission free natural gas dehydrator technology may be incorporated into new or retrofitted to existing systems of any capacity without variance in efficiency or functionality. Unlike other BTEX systems that depend upon ambient cooling, the Engineered Concepts retrofit is a temperature controlled “all-weather” system. The process consumes or sells all uncondensed hydrocarbons and is unaffected by gas volume or “rich gas” content. The manufacturer that higher gas volumes and the richer the gas content speeds the operators pay back. Retrofitting to an existing dehydrator usually requires minimal field construction and applies to small remote wellhead applications, large plant dehydrators, or offshore service – anywhere elimination of hydrocarbon emissions, increased dehydrator performance, and improved safety is desired. This technology eliminates odours and creates a safer working environment while reducing fuel requirements and maintenance.